Citizen presents his design of city's trademark image at City Council meeting. 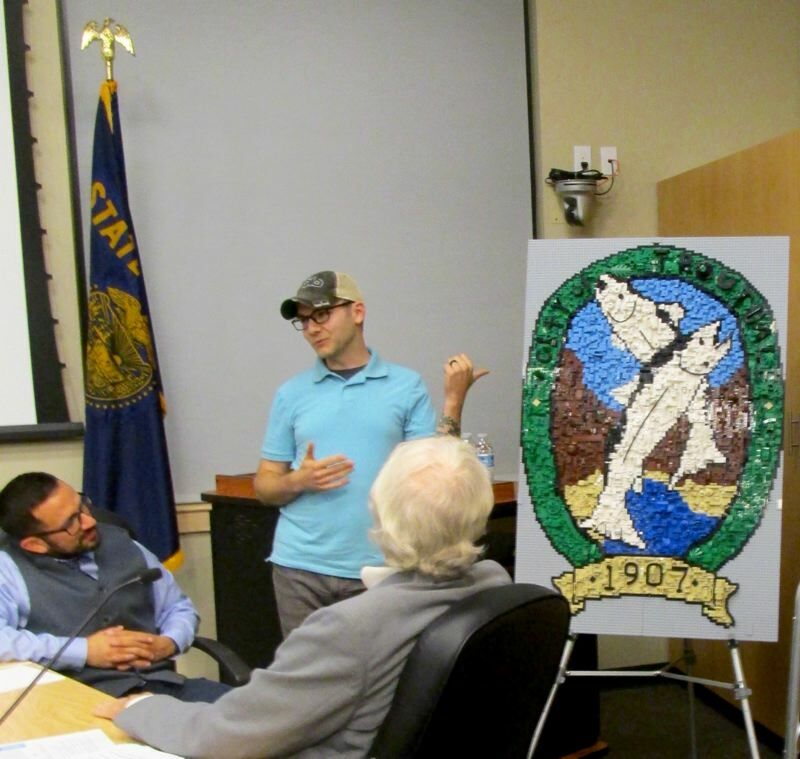 Brett Hooper created a representation of the city of Troutdale's logo, which includes the recognizable two fish jumping out of a river and crossing paths. But what makes his piece unique is it's made from Legos. Hooper presented his creation to the Troutdale City Council on Tuesday, Oct. 23. "How many Legos went into that?" asked Mayor Casey Ryan. "A lot," Hooper quipped, before estimating it took a few thousand Legos to complete the project. Construction, he said, took a few months and he had some help from his children. Hooper used a computer program to aid with the design process. Ryan asked to how much it would cost to purchase the piece, and after assuring Hooper he wasn't joking, told Hooper to talk to Troutdale City Manager Ray Young about negotiating a purchase price. "We'll lease it back to you when you want it," Ryan said. The city is currently borrowing the artwork from Hooper, and it will be displayed for the next month at Troutdale Police Community Center's Kellogg Room, 234 S.W. Kendall Court, during public meetings.